Sea Ray was founded in 1959 by Connie Ray, when he bought a small fiberglass shop in Detroit that made a 16-foot family runabout. By 1970’s, Sea Ray emerge as a powerhouse in the boating industry. Today, Sea Ray is by far the leading brand of boats in the U.S. We did mattress and bedding for this Sea Ray 350 Coupe. 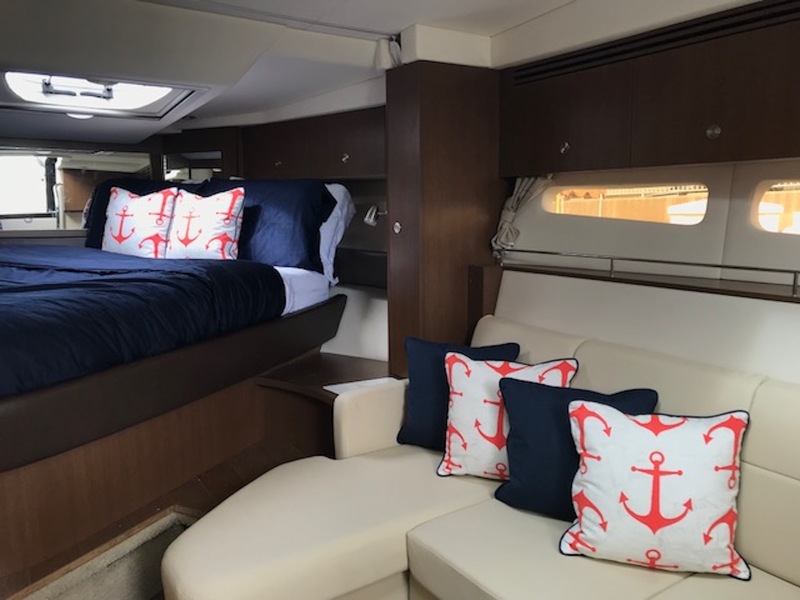 Having a good comfortable mattress on your boat is crucial if you want to enjoy your nights as much as your days while you are out cruising on water. Getting a great night of sleep on your boat has never been easier. With several boat mattress and mattress topper options to choose from, we are able to create a sleeping solution to fit all budgets. Each boat mattress we make is crafted custom in California and built to stand up to rigors of a marine environment. We make everything custom to fit the size and shape of your berth. We can make your mattresses and toppers from any material you prefer but we always recommend Latex. The benefits of a latex mattress include being mold and mildew resistant, extremely comfortable, latex helps regulate body heat, which allows you to sleep cooler and it is bendable and breathable. For this client, we provided our 7” Commodore. 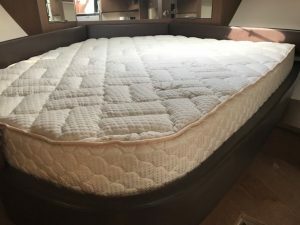 This custom latex mattress is constructed with a 6″ Latex core and covered in an ultra-soft bamboo quilting. The result is a super comfortable mattress. We always recommend our 600 thread count Egyptian Cotton sheets to our customers to go with their mattress. Our sheets come as a set including a flat sheet, fitted sheet and matching pillow cases. They are very easy to put on and give a fresh, crisp look to the bed. Our custom fit solid 600 thread count duvet provides a soft, classic look while being extremely comfortable. You see on in the image here. You can mix and match from the variety of colors available to get your desired look. Our custom duvets are down alternative, low to medium loft that provide comfort and warmth without the bulk. Browse our website to view our other bedding collections including our quilted coverlets, blankets and also our Sferra Collection for our percale lovers. At Yachtbedding.com, our goal is to keep it simple and convenient for our clients and at the same time, provide you with variety to make your stateroom, A STATEMENT ROOM.